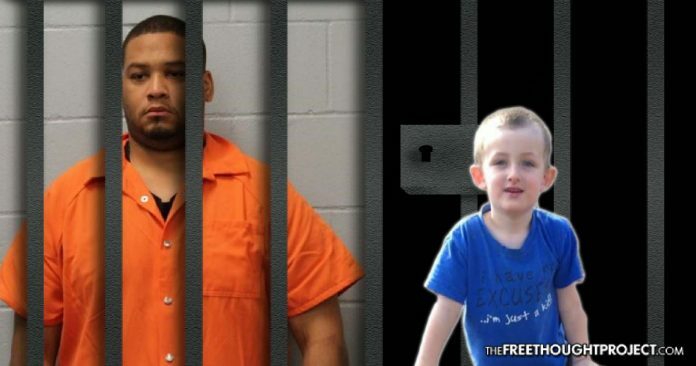 Marksville, LA — Moments ago, in one of the stiffest sentences ever handed down to a cop for killing an innocent person while on duty, one of the Marksville police officers who killed 6-year-old Jeremy Mardis was sentenced — to 40 years in prison. As the Free Thought Project reported last week, Officer Derrick Stafford was found guilty of manslaughter and attempted manslaughter in the horrific fatal shooting of the six-year-old with autism on November 3, 2015. During the heartbreaking trial, Chris Few, Jeremy’s dad, noted that Stafford and officer Norris Greenhouse Jr. immediately started firing — with no warning — when they stopped him on that fateful night. After he was shot, Few lost consciousness and didn’t know his son died until he woke up in a hospital six days later — the day of Jeremy’s funeral. “Innocent people do not run from the police. Innocent people stop their vehicles, surrender to the police,” defense attorney Jonathan Goins said as he called Few “the author of that child’s fate,” during the trial. However, the jury and the judge did not buy it. As the Associated Press reports, Ruth Wisher, a spokeswoman for Attorney General Jeff Landry’s office, said Stafford was sentenced to 40 years for manslaughter and 15 years for attempted manslaughter. He will serve the sentences concurrently. Stafford was facing a maximum sentence of 60 years for his role in the murder of Jeremy Mardis when state District Judge William Bennett sentenced him. The fact that a police officer received such a hefty sentence is a win for victims of police misconduct across the country. All too often we see police officers murder the innocent only to be exonerated by a grand jury or acquitted during a trial. Case in point: Officer Joseph Weekley. Weekley had not been on the force since 2010 when he shot a sleeping child in the head during a botched raid executed on the wrong home. Not only was the justice system unable to hold Weekley accountable for the slaughter of a young girl — but he was reinstated to the force in 2015. Unfortunately for the family of little Aiyana, justice failed them. However, in Jeremy’s case, they seem to be making ground — for now. The other cop who shot and killed Jeremy that night has yet to go to trial. Greenhouse, whose defense team has been pulling insane tactics out of the woodwork up to and including demanding to know if any prosecution witnesses underwent hypnosis or any “truth-determining examinations,” such as polygraph tests or sodium pentothal. Greenhouse also happens to be the son of the assistant district attorney in Marksville. As the Free Thought Project has previously reported, this entire scenario could’ve been over a relationship. In November 2015, Few’s fiancée came forward about her relationship to Greenhouse. According to the Advocate, Megan Dixon, Few’s fiancée at the time, said Few had a previous run-in with Greenhouse. A former high school classmate of Dixon, Greenhouse had started messaging her on Facebook and had come by the house Few and Dixon were sharing at the time. The tainted relationship appears to be the only possible motive for the stop that night as no definitive explanation has yet to be given as to why Greenhouse was moonlighting, riding alone that night and decided to pull Few over. According to the Greenhouse and Stafford, the officers decided to conduct a traffic stop because Few had an outstanding warrant. However, the Clerk of Court, the District Attorney’s Office, Marksville Police Department, and City Court noted that they did not have any warrants against him. The officers also claimed Few had a weapon, that was also a lie. The only reason Few ran from Greenhouse that night was to catch up with Dixon so he could give her Jeremy in case he was arrested. “The whole reason there was even a chase was for his well-being,” he said. Dixon’s testimony did confirm that Few was, in fact, attempting to wave her down and pointing at Jeremy. Sally LaBorde, a passenger in the van Dixon was driving, also testified, saying she could clearly see Few pointing to Jeremy in the car, and the implication was unmistakable that he wanted Dixon to take care of his son, according to the Advocate. Sadly, for Jeremy Mardis, who will never see another Christmas or Birthday or throw the ball with his dad, the reason for the stop that night is irrelevant. However, for his family, the outcome of Greenhouse’s future trial and the fact that Stafford just got 40 years, are the only things that can provide even a semblance of comfort.